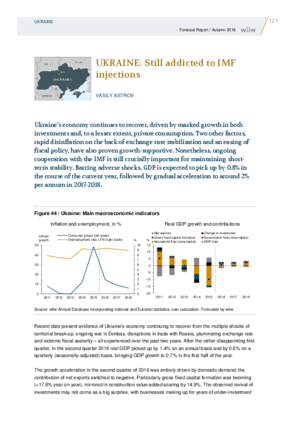 Ukraine’s economy continues to recover, driven by marked growth in both investments and, to a lesser extent, private consumption. Two other factors, rapid disinflation on the back of exchange rate stabilisation and an easing of fiscal policy, have also proven growth-supportive. Nonetheless, ongoing cooperation with the IMF is still crucially important for maintaining short-term stability. Barring adverse shocks, GDP is expected to pick up by 0.8% in the course of the current year, followed by gradual acceleration to around 2% per annum in 2017-2018.